We knew it was coming, but today Samsung officially lifted the veil off its new BlackJack smartphone. The Windows Mobile-based phone will have everything you'd expect from a smartphone (QWERTY keypad, 320x240 screen, 1.3-megapixal camera) and at 3.5 ounces, it'll also weight less than the 4.1-ounce Q. Samsung claims the BlackJack's battery will last for 11 days in standby mode and deliver 5.5 hours of talk time. We'll have more on that, as having a short battery life was one of the Q's main shortcomings. 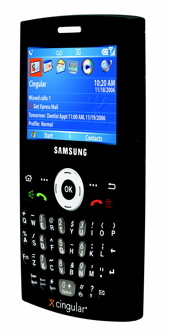 Otherwise, the BlackJack is packing Bluetooth 2.0 (sorry, no Wi-Fi), hooks up with Cingular's HSDPA network, and has a microSD card slot for further expansion. 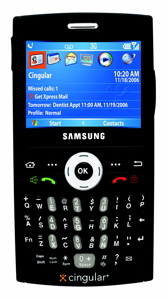 It's ll be available via Cingular for $199 (which is almost twice what the Q is going for nowadays). Click through for some extra shots of the BlackJack.